The final weekend of winter is here, and not soon enough for institutions in the Archdiocese of Baltimore that have had to deal with adjustments to the school calendar, clean up from burst water pipes, the cost of snow removal and a drop in Mass attendance that affected the collection basket. As a result of all schools in the archdiocese exceeding the five snow days built into the calendar, the last day for students in Catholic schools has been moved to June 12. It had been June 10. The two additional days had already been identified as possible make-up days. Barbara McGraw Edmondson, superintendent and executive director of Catholic education in the archdiocese, informed administrators of that adjustment March 11. Most schools follow the public school closing policy in their jurisdiction, and some Catholic schools might be making additional adjustments. Days lost to winter weather, for instance, ranged from six in Anne Arundel County to 10 in Harford. 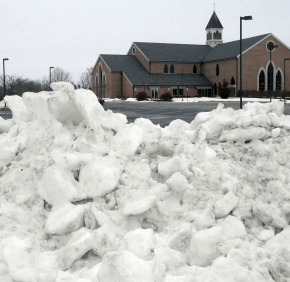 As of March 9, meanwhile, the archdiocese had processed 24 claims of property damage over the winter, all in February and most covered by insurance, totaling approximately $1 million in damage, according to archdiocesan spokesman Sean Caine. Most notable was the closure of the Basilica of the National Shrine of the Assumption of the Blessed Virgin Mary in Baltimore for several days due to frozen coils in the heating system that caused it to shut down. The basilica reopened Feb. 25. That was part of the aftermath of a powerful front that that had blown into Baltimore four days earlier, on Valentine’s Day. It was the first of four straight long weekends in which schools and their activities were affected, sandwiched around a similar impact on weekend Mass attendance. Other pastors also cited the benefit of weekly donations through programs such as Faith Direct. Adding to the financial challenge was the second-coldest February on record in Baltimore. “What has been brutal has been utility expenses,” said John Papania, the business manager at St. Paul Parish in Ellicott City. He said that it cost $2,300 to heat the church in February, in contrast to the $2,500 to $3,000 budgeted monthly for the entire six-building campus. St. Paul was among the many parishes dealing with water damage from frozen pipes. It, St. Patrick in Havre de Grace and St. Joseph-on-Carrollton Manor in Buckeystown were among those dealing with issues related to sprinkler systems. In Buckeystown, water damage to the new church that was dedicated last May was mitigated by the presence of workers tending to a malfunctioning heating system. He presumes that thawing pipes caused the malfunction, and is grateful that the sacristy is not carpeted, and that staff were on hand to remove the water and minimize damage. While every parish and school had to deal with snow removal, not everyone had a resource like the one Monsignor Farmer had in Westminster. Chris Partenza, a St. John parishioner for 15 years and the father of four who have graduated from its parish school or are attending it now, is the owner and operator of Ichabod Tree Service. He builds no profit into what he charges the parish for keeping its parking lots clean and safe. That creek could rise, as the forecast calls for an inch of rain to fall in the region March 13 and 14, with flash flooding possible.